US, 1962, 110 minutes, Black and white. Warren Beatty, Eva Marie Saint, Brandon de Wilde, Angela Lansbury, Karl Maiden, Barbara Baxley, Constance Ford, Evan Evans. 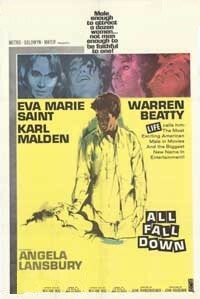 All Fall Down is one of John Frankenheimer's films. It preceded such notable films as The Manchurian Candidate, Seven Days in May and Seconds. These black and white features preceded his colour phase which began with Grand Prix in 1967 and continued with such films as The Fixer and the Gypsy Moths and his preoccupation with physical exertion and growing older. This film is based on a novel by James Leo Herlihy (Midnight Cowboy) with a screenplay by William Inge (Come Back, Little Sheba; Picnic; Dark at the Top of the Stairs). It is a picture of a family and its problems and a presentation of the family as representing America. It is a frightening picture especially of parents and a dominating mother, ineffectual father, with the dire emotional effects on drifter son and sensitive son. The screenplay is frequently sharp, acting very good, with many effective sequences for audience emotional response. All Fall Down, while generally pessimistic, is not entirely without hope. 1. The significance of the title - its use in nursery rhymes, games, the continuity with the realism of this film, idols crashing? How good a title was it? 2. Comment on the picture of America and the setting for this story. How typically American was it? How universal? The detailed presentation of Florida, the black and white photography, the town's Berry Berry's ride home, Berry Berry's home and the style at home? 3. How central was the character of Clint? How did the audience see the even through his eyes? His sensitivity? His idealism and optimism? His notebook and taking down people's conversations and reactions? His capacity for admiration? His crush on Echo, and her car? The disillusionment for him when all fell down? How did he change during the film? How did he grow up? How important was it that the audience saw through his eyes, yet saw that he was immature? How did this get a complex reaction from the audience? 4. How attractive a man was Berry Berry? Warren Beatty's personality? The fact that he was a model for Clint? That he was so admired by Clint? And yet contrast with the reality: Berry Berry disliked in Florida, the police take the two hundred dollars, the prostitute's admiration for him? Berry revealed by his trip home? The yachtswoman taking him as a gigolo? The schoolteacher going through the game of getting him to be her guide? His abandoning her? How did this alter audience reaction to him or did it rei. force audience dislike? Berry as seen within his family context? Did this make a difference? The result of his mother's possessiveness? Crush his emotion? The inability of his father to give support? Except weak humour? Berry as a drifter unable to settle? His infatuation with Echo? Her response to him? Could she have changed him? Reaction to irresponsibility as regards her pregnancy? His reaction to her death? What should it have been? Did the audience side with Clint in wanting to kill him? What future did Berry have? An emotionally crushed vagrant? typical of Everyman? 5. The picture of parents in this film? Was it just? How horrible? Annabel voracious? Devouring in her love for her children? Loving them for herself and not for themselves? Her decorating the house etc? Her emotional outburst of loving Berry despite his sins; her sometimes good-sense? How stupid a woman was she? How cruel? Where did her sense lie? Contrasting with the father? His secret drinking, his forced joviality and jokes, the odd situation with the three poor men at Christmas? His being outwitted by Annabel? Did he have any strengths of character? His relating to Clint Berry Berry, Echo? What love was there between husband and wife? How responsible were the parents for the way Berry Berry had turned out? 6. How attractive a character was Echo? The change in atmosphere when she arrived? As ageing and as disillusioned? As having needs and emotional wants? Why did she feel so at home? Her love for Clint and his admiration for her? Her leading him on without realising it? Why was she swept off her feet by Berry Berry? The result of her pregnancy? Her reaction to this? Her disillusionment with Berry Berry? Did she kill herself or was it an accident? How sad was this ultimate portrait of Echo? 7. How strong was the film in smaller sequences, e.g. Berry Berry's encounter with the Yacht's woman, the interlude with the teacher, the revealing of strong emotional needs as all centring on Berry Berry? What did this add to the film? 8. How important were photographic details for atmosphere in the film - the bridge in Florida and the bus etc., the Florida atmosphere, photography in the home, e.g. the three levels of the home, the strange sequence of the three men and their taking the money? What did this add to the quality of the film? 10. How optimistic was this film, how pessimistic?